“City Archivist from 1974 to 1984, Georges Girard was one of the best specialists of the Occitan Rouergue and literature of the nineteenth and early twentieth centuries. A great connoisseur of the works of Claude Peyrot, he himself composed poems in Occitan and French. Georges Girard created in Millau the Catholic Relief Services. Parish librarian, he was also the organist at St. Martin's Church where his funeral was held, shortly before celebrating his 90th birthday. Georges Girard was finally, and perhaps most of all, devoted to Emma Calvé. He is the author of a reference book on the great singer [above]. President of the Society of Friends of Emma Calvé, he donated to the Millau Museum Calvé’s prodigious collection of costumes, jewelery and documents that belonged to this famous interpreter of Carmen. The City is preparing to publish the catalog, which he prefaced. A tribute to Emma Calvé, this publication will also be for each of us, a tribute to Georges Girard. 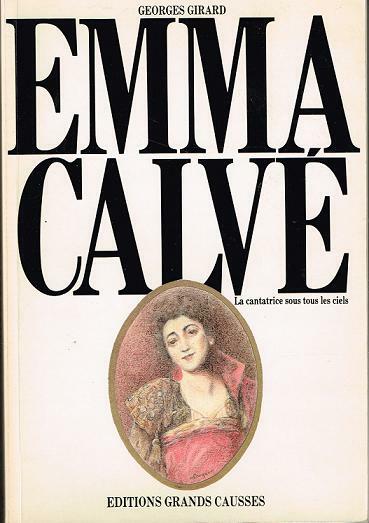 “Rosa Emma Calvé, born on 15 August, 1858 at Decazeville, had a scintillating career as a singer in the 1900s, when the opera had reached its zenith. Formerly a salesgirl for gloves at Millau, she could neither read music nor play the piano. Notably in the role of Bizet's Carmen, which she was to sing more than 1300 times, she became the driving force behind famous composers such as Massenet and Reynaldo Hahn. A grateful nation awarded her with the Chevalier de la Légion d'Honneur. As a pioneer of the impressive shows in the style of Barnum, touring the world from Paris to New York via Rome, she became the idol of public passion and won the admiration of the most famous personalities of the period. Driven by an insatiable curiosity she studied spiritualism, Yoga, Hinduism and Buddhism. One finds her immoderate passion reflected in a baroque, medieval castle in Cabrières, which swallowed up a good part of her wealth. Calvé is believed to have had several love-affairs; but after a marriage to an Italian tenor, however, which ended in divorce, the only true love of her life was Henri Cain. This brilliant young man, who belonged to the smart set of Paris, was a writer and portrait painter.